The crazy winds are in full force here! But it's a good day to stay in and do a little crafting. It's the final week of this Your Next Stamp challenge before a new sketch and color are up. This is a great sketch perfect for spotlighting an image or sentiment. For my card, I am using the Stacked with Fun set and dies to create this cute window scene. 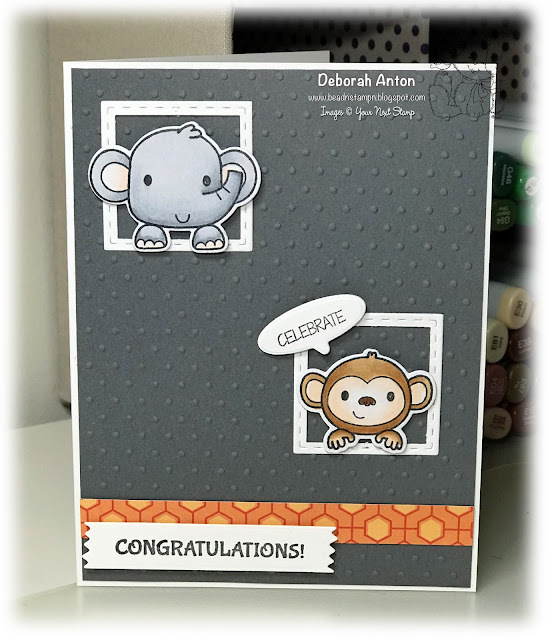 The background is embossed with the Swiss Dots embossing folder while the windows are made using my 1 1/4" square punch and the 1 1/2" Stitched Square die set from YNS. The images were colored in with Copics and cut out with the coordinating die set before being popped up in the window. I added a scrap patterned paper strip for added color and element before adding the Washi Tape die cut with the sentiment over that. I think if I were to make this type of card again, I would make an interesting colored background in the window. I don't know... I think it would make an interesting contrast. We hope you play along with us and upload your creation to the YNS Challenge Blog for your chance to win! Thanks so much for stopping by and taking a peek!